No, this isn’t about American F-16 fighter jets, German attack submarines, or anything else Egyptian military related. KingFut’s Hosam El-Aker analyzes a matter of much greater importance… The Egyptian national football team’s defenses. It’s completely normal and expected for a foreign manager to implement their own ideas when taking over the Egypt job. However, these strategies are typically in contrast to the traditional approach of Egyptian tacticians. It’s been the same tug-of-war since the late 90s, when Frenchman Girard Gili took over for legendary Egyptian manager Mahmoud El-Gohary… Foreign manager employs a new defensive set, the team concedes goals at a higher pace, panic ensues, an Egyptian manager takes over again and reverts back to a more familiar system. There are numerous intricacies involved with these competing systems, more or less depending on the coach, but the biggest difference is typically with the general formation, positioning and defensive approach. 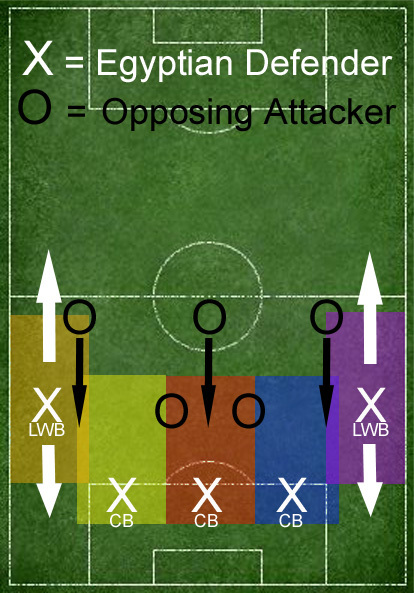 All other aspects, such as attacking style, are more fluid and often change on a match-by-match basis based on available personnel and opponent. There’s considerably more to these defensive schemes than I’ve broken down in this piece, namely the roles of midfielders and attackers, but I’ll just focus on the defenders themselves here. Egypt recently fielded three centre-backs for the first time under American tactician Bob Bradley. Fans automatically thought that he was reverting to Egypt’s traditional three-man defense, with two proper centre-backs marking man-to-man and a sweeper or “libero.” Reverting to the more familiar past wouldn’t have been a shock given the team’s current defensive woes. Egypt’s classical three-back, man-to-man/Sweeper system. 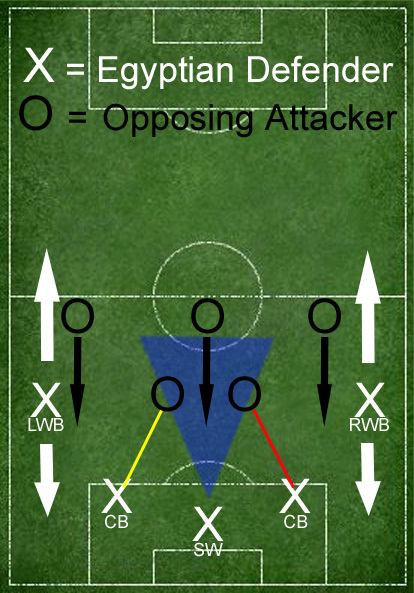 As the illustration above shows, the traditional system, most recently employed by former manager Hassan Shehata, directs the two outside centre-backs to mark opposing attackers (usually strikers) man-to-man (see yellow and red lines). The sweeper (“libero”) is positioned in between and is there to clean-up any mess behind the man-marking centre-backs. He’s also free to advance into the defensive midfield and nip attacks in the bud in front of the centre-backs (see blue triangle). However, this strategy is not what Bradley employed in Egypt’s 4-2 World Cup qualifying win in Zimbabwe, contrary to popular belief. Instead, all three centre-backs and both wingers/full-backs (outside defenders) played zonal defense (not man-to-man), as the two centre-backs in a four-man backline also typically would. Three-centre-back zonal defense played by Egypt in Zimbabwe. Two-centre-back zonal defense preferred by Bob Bradley and popular internationally. The above images illustrate the basic principles of the zone scheme. The colored areas indicate territorial zones each defender within that respective area is assigned to cover. The top image shows the three-centre-back scheme deployed in Harare, while the bottom image shows Bradley’s preferred (and the more internationally popular) two-centre-back zone set. The match in Harare was the first time in my memory that Egypt has ever employed a zonal system with three-centre-backs. Previously, Egypt has only ever played zone defenses in official matches using just two centre-backs (4-4-2, 4-5-1, etc.). The three-centre-back zone scheme also gained considerable notoriety this past season when Juventus rode it all the way to a Serie A title. On paper, it seems to be the perfect marriage between modern two-centre-back, zonal defenses and Egypt’s traditional three-player, man/sweeper scheme. However, there seemed to be some growing pains in the defense despite the win, in the form of slow reactions and wrong decisions. This, however, is to be expected. 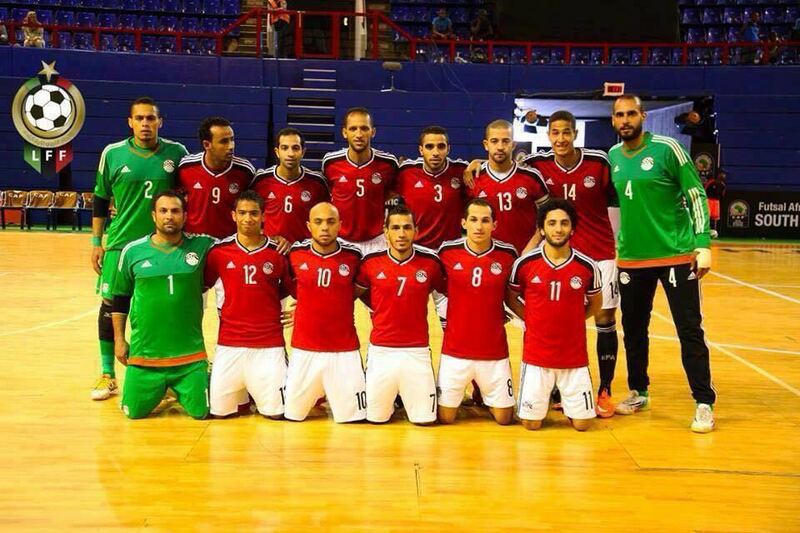 The Egyptian defender isn’t used to having to make as many decisions as zonal defenses demand. A man-to-man scheme is more straight-forward… you’re assigned a player to mark and you follow them around in attack. But with the tactical complexity of modern attacks, this could leave gaping holes in a defense. This is where zonal defenses are at an advantage when executed properly. 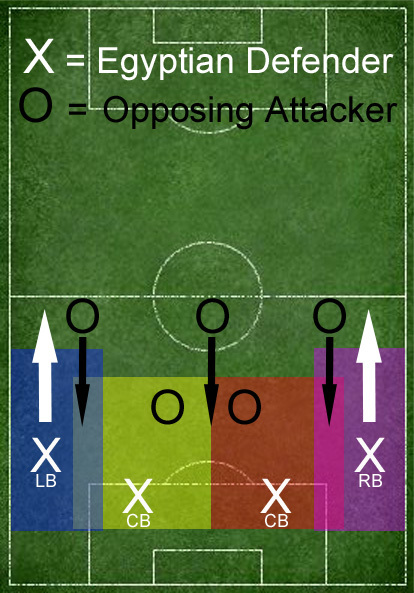 It limits the movement of the centre-backs because they’re assigned a section of the field to mark, instead of a man. If every centre-back sticks to their assignment, the territorial integrity of the defense will always remain intact, i.e. each geographical segment of the defense will be covered by someone. No aforementioned gaping holes. Another advantage of using three centre-backs instead of two is that it frees-up both Fullbacks to advance further forward, rendering them wing-backs (or wingers, or flying wingers). 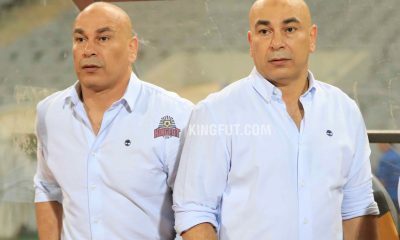 While Ahmed Fathi (right wing-back) and Ahmed Shedid (left wing-back) assumed those roles in Harare, it seems they were instructed to play more conservatively, i.e. remain in defense more often, much like full-backs would in a four-man backline. Furthermore, a three-centre-back, zone oriented backline masques common weaknesses that exist with most of Egypt’s current defenders. With the exception of Fiorentina centre-back Ahmed Hegazy, they simply lack the skillset to survive on the international stage playing in pairs. What they lack in ability, a zonal three-centre-back set compensates for with numbers and assignments. As the illustrations above show, the centre-backs are forced to cover less territory when there are three of them than when there are just two, as Bradley originally preferred when he arrived. Egypt simply does not have the defensive personnel needed to have the luxury of playing with just two centre-backs and it appears Bradley and his staff are willing to assume tactical flexibility in order to alleviate this reality. Egypt has collected just one clean sheet (against Swaziland) in its last seven matches and has allowed a whopping 16 goals in that span. The challenge for Bradley will be to continue getting results while the team acclimates to his tactical changes. He’s dealing with defenders that play almost exclusive man-to-man defense with their clubs (with the notable exception of Hegazy). The time they spend with the national team is limited by comparison. The more they get used to Bradley’s system though, the more effective the scheme will be, as players begin to react more instead of having to think too much.